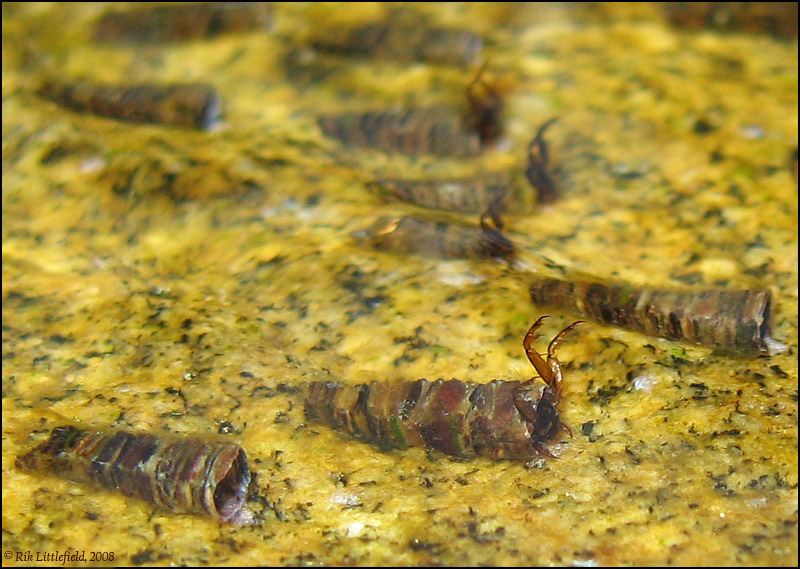 Skipping to the end of the story, here are some caddisfly larvae, live and feeding in running water. 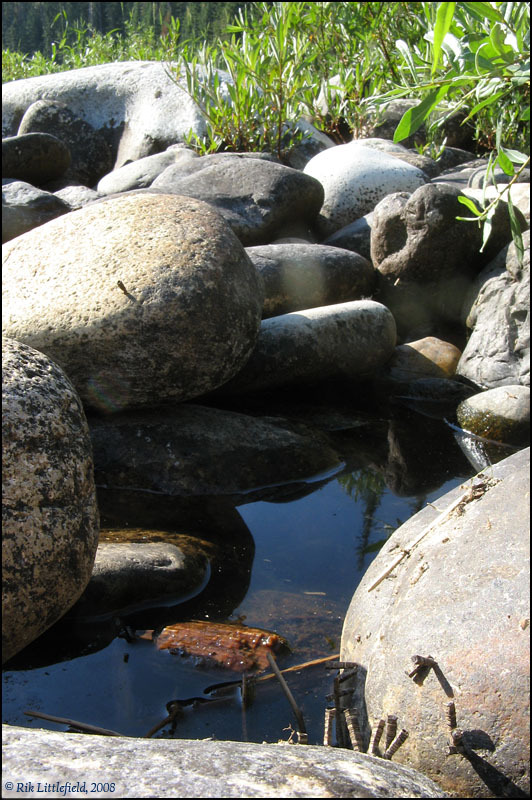 Location is the Lochsa River at White Sands campground, near Lolo Pass on the Idaho-Montana border, approximately 4100 ft elevation, August 17. Case length of larvae about 10 mm. On closer inspection, they looked like this. I'm pretty sure that those are caddisfly larvae in image 1, and the left-over cases of same in images 2 and 3. But these shots are basically "drive-by macro" -- I camped only one night at this spot and had no opportunity to follow these things through their development cycle. I'm only taking it on faith and general similarity that all three images show the same beasts, and I have no idea how the cases might transition from the flat posture shown in image #1 to the perpendicular posture shown in #2 and #3. Any subject-matter experts out there, please feel free to chime in with additional or contradictory information about these things. Technical: Canon A710 IS camera, no accessories. Image #1 was shot with on-camera strobe, no diffuser, cropped to about 40% of field width. Edit: to correct technical info. Great shots Rik! In the first one it looks as tho the camera is under water! Nice job! The first photo made them look like they came straight out of a monster film. What is that yellow stuff in the first image and what are they doing sticking their legs out like that? Close-up photos of the bits and pieces used by the different spp. of caddisfly larvae would make an interesting montage. cases square in cross-section; made of sand or pieces of plant debris; found in running water including cold mountain streams. 34 spp. widespread. Caddis larva are always fascinating to come across. I am amazed at how they construct these tiny to small cases with such delicacy and accuracy. I had a few of these in a white plastic tray once, while out seining a mountain stream for various benthos, to see just how many different ones I could find. When placed in the tray with other caddis and benthos, they proved to be quite aggressive. Not only aggressive to other benthos but towards each other as well. One caddis I noticed, was taking on a very large Stone fly nymph that I had placed in the tray! Wonderful and interesting photos there Rik, things like this always seem to capture my attention. It's also fascinating how they make square boxes. I thought it would've been hexagonal. Thanks for the compliments, questions, and added info! In the first one it looks as tho the camera is under water! It does, doesn't it? The actual setup was that the camera was positioned a couple of inches above the water, looking a little bit downward into a smooth flow. The surface of the water had moving waves, but with flash and some good luck, I got a few shots that were looking through clear "windows" between the waves. What is that yellow stuff in the first image and what are they doing sticking their legs out like that? The yellow stuff is a slippery film that grows on underwater surfaces. I presume it's a combination of bacteria and algae, probably teeming with protozoa too. The legs are probably being held out to snag passing prey or other organic particles for food. 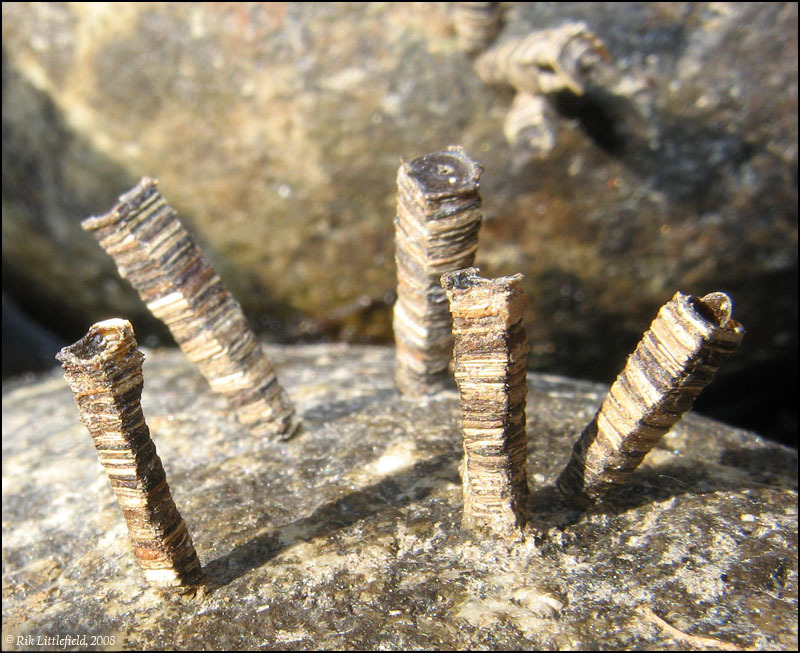 Various caddisflies have different diets and methods for collecting their food. Some of them even spin underwater nets. Just from appearances, I'd guess that the strategy of these critters is to sit still and let the river bring food to them in big chunks. So, they are initially mobile and then form small sky-scraper cities. They certainly appear to be well attached to the rock. A basic distinction of pupation for almost all case-making species is that larvae undergo a metamorphosis within their case, thereby retaining the energy and silk protein already invested in the portable case. Pupation behaviour is indicated when the larvae fastens the case with silk to a firm substrate such as rock or large piece of wood. Now notice that in image #3, you can see that the center case appears to still be capped, while the rightmost case appears to have been capped at one time, but now the cap is popped loose and sitting crosswise in the wide end of the case. I presume that these particular cases are now above water only because the water level has dropped. The reference that you found (great reference!) does mention death of pupae due to receding water levels. I'm only speculating, but it's possible that what we're seeing here are a couple of cases (left and right) where the occupants successfully completed development and got out before the water dropped, and one case (center) where that didn't happen. Excellent photos Rik. Could they actually relocate themselves above the waterline and change to a vertical position for final development? Could they actually relocate themselves above the waterline and change to a vertical position for final development? Don't know. The reference mentions only pupation underwater. But that upright posture is a head-scratcher in any case. The larvae I found were located in pretty rapid flow and I think it would be difficult or impossible for them to hold an upright position against it. So either I'm wrong about that, or they found a quieter place to pupate, or they did it above water as you suggest, or the upright posture is something that happens as a side effect of drying out, or something else that I haven't thought of yet. That last one is always a good way to bet. From what I have read, caddis pupate underwater and explode to the surface as adults, driving tout wild! Some caddis make it some don’t, either to adulthood or at the mercy of the trout. As for them standing up like this, they look to be quite large from those that I have seen here but standing up like this may facilitate the rapid escape to the surface. Probably a difference in species east to west. However, those that don’t make it to adulthood are more than likely the reason for mass egg laying, to ensure the survival of the species. From what little I have read on insects in general, not all hatch successfully. For the most part of what I have observed while out fishing, it seems Caddis and Mayflies attach themselves just inside the boundary layer that occurs between the substrate (rock) and the flow of the water across it. It is much calmer there and they are less likely to be swept away by the faster moving current. Very interesting. I was unaware of the square design. In the UK I believe we get stick versions or stone versions, nothing so geometric as square. When I was a kid in Colorado, at summer camp near Steamboat Springs, these guys used garnets in their protective tubes. Garnet is like a poor man's ruby but I was impressed!